Chair cushions for patio chairs, too. Kitchen chair cushions not only give a softer seating, but also an opportunity to add color and pattern to your kitchen. You may have nice kitchen chairs but your family doesn't linger over meals. The comfort of your chairs could be the reason for hasty meals. Examine your chairs and test sit with attention to your comfort level. If you find yourself squirming and shifting in the chair after only a few minutes, it's time to either replace your present cushions or add chair cushions. 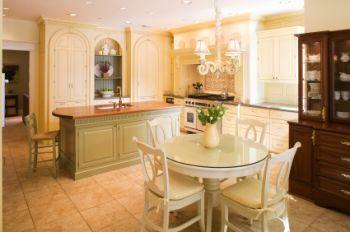 There are several things you want to consider before purchasing chair cushions for your kitchen. You'll need to measure the seat of your chairs to know how big a cushion your chair will hold. Typically, you'll want the cushion to fall slightly over the edge of the chair to make sure the seat is comfortable. A cushion that is too small for a chair will be very uncomfortable. You'll want to purchase a cushion that matches the shape of the seat in your chairs. This might sound simple, but some seats are round, others may have rounded corners. You can purchase square cushions that look like pillows. Some cushions have a curved back and a squared front to allow it to form fit into chairs. The shape of the chair seat will determine which cushion shape best fits your chairs. A tufted cushion allows for a denser and thicker cushion in addition to being heavier than a non-tufted cushion. You can purchase hand-tufted cushions that come with or without buttons. Many times the buttons are covered in the same material as the cushion to give a very polished and sophisticated look. Many cushion styles have ties to secure the cushion in the chair so it won't slip or come out when you sit down. Some of the ties are very discreet and aren't very noticeable while other ties are part of the overall look and are designed to add a design element with bow ties. Most tie cushions use rear seat ties only. Some cushions are heavy enough not to require corner ties and fit snuggly into the seat pocket without the aid of ties. Some cushions have an underside made of foam latex backing. This creates what's known as a gripper cushion because the foam grips to the chair seat and prevents the cushion from slipping. There are several ways to finish the cushion edges. Some of the popular finishes include a whip stitch edging. The whip stitch is used to seam two fabrics together and create a uniform finished look. A strand of thread is drawn along the fabric edges and the stitches are whipped over the edges and the thread. This technique also anchors the thread in place. Piped, welt or rolled edging gives a tailored look. A piped edging is created by sewing the material together. Instead of trimming the material to the seam, it's left in place. The material is then turned right side out and the excess material serves as filler for the tube or pipe created. Welt edging is created using rope or welt rope and wrapping with material. A knife-edged cushion has a thicker center than the edges. The seams tend to run along the outer edges of the cushion. Waterfall edging is similar to knife-edged cushions. The top and bottom panels of fabric are sewn together with an edging that looks like a waterfall. Waterfall edged cushions are thicker than knife-edged cushions and often have a ballooned effect created by overstuffing. Box edges can be found on a square cushion that is unusually thick. The edges are often finished in a welt or pipe edging. The top and bottom fabric sheets are sewn together with a strip of fabric that is double seamed. Boxed edges are usually piped or welted to complete the look. Fabrics used for chair cushions are often the same ones used in other upholstery pieces. The fabric you choose can create an entirely different look for your kitchen dining area. Many times you can find matching fabric for draperies or curtains to carry the pattern throughout the kitchen. You may prefer to find a contrasting or matching fabric to complement your chair cushions. If your budget allows, you may wish to choose a couple of sets of kitchen chair cushions to change with the seasons and give your kitchen a fresh new look.